In the beginning God created the heavens and the earth. And the earth was barren, only a brown mass in the garden above Brant Lake, in the area where horses graze. (Although they were created at a later time.) And along came the gardener, and gentle brown hills of dirt covered one section of the earth in the garden above Brant Lake. And the gardener planted seeds. Little seeds, like manna from heaven. And it was day one. And it was very good. Nothing happened to the brown hills. It was still too early. It was only spring. The rains came. Steady light rains. And rain covered the earth. And the rain was very good. And then they came. Little sprouts of green emerged from the hills of earth that God created—with the help of the gardener. And God named one cluster of green sprouts zucchini. And the second pumpkin. And the third cucumber. Finally, gourds came forth. In those days each hill knew its proper place in the garden. There was peace in the garden. And it was good. Very good. Soon the hills were dressed in green. Tiny yellow flowers adorned the plants. Yellow flowers good enough to eat. Dip two zucchini flowers in batter. Coat entirely. Let the overflow drip off. Fry flowers in hot oil until crisp and golden brown. Place flowers on paper towels then season with salt and pepper. And God said: these are good. Very good. And it was a second day. A delicious day. But the farmer decided not to eat the flowers. He preferred ice cream. Mint chocolate chip. In addition, he wanted to eat the fresh vegetables that would emerge from the flowers. So he didn’t eat the flowers. He let them be. And that was also good. Very good. Still, there was peace in the garden. But each hill had one bad seed. As happens so often in families. 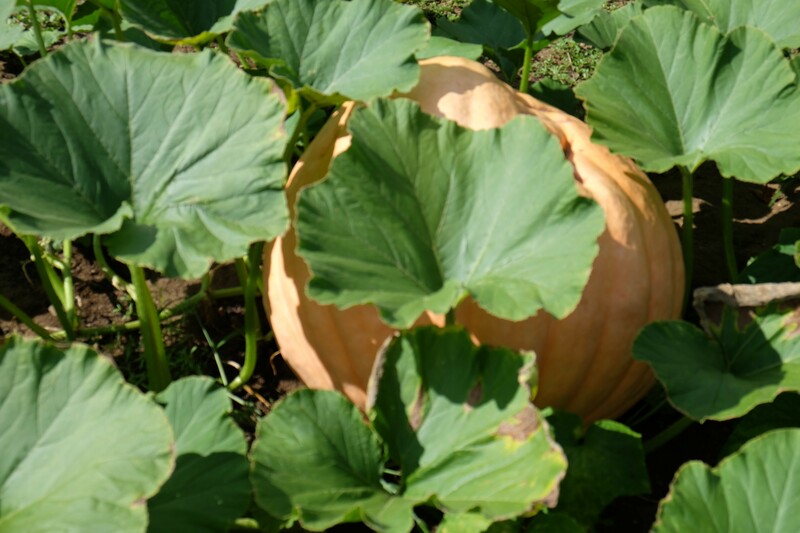 By mid summer the pumpkins, destined to be giant pumpkins over 250 pounds, advanced to the north and invaded the cucumbers which were too small to defend themselves. And, advancing from the south, the gourds tangled with the zucchini. And the poor cherry tomatoes. I know. I haven’t mentioned the tomatoes. Planted on the third day. Well, the tomatoes were consumed by the vines of cucumbers that sought revenge from the pumpkin invasion. Poor lowly tomatoes. Scapegoats for the cucumbers which were unable to fight off the giant pumpkins. And now the earth was overrun with green, one plant invading the territory of another and no plant respected its proper place on the earth. Then, from above, a song echoed forth, a song that many generations later would become a famous folk song when applied to human anatomy. Oh, hear the word of the Lord. And it was not very good. It was not very good. So that is how war entered the world, a war that would cease only in October when all the plants died off. Season after season this pattern repeated on the earth and God wondered if the earth would ever learn, or would they always invade each other—until the end of time. September 11, 2016 in Brant Lake.